Project Santa Cruz offers a promising look at what our virtual reality future could be, even though it's still a prototype. The headset is similar to Oculus Rift in many respects, but the lack of wire and addition of 6DOF controllers make all the difference. Update: F8 2018, Facebook's big developer conference, came and went in early May without Project Santa Cruz releasing into the wild, likely to the disappointment of many hoping for details on the powerful wireless VR headset. But Santa Cruz hopefuls weren't left empty handed as Facebook CTO Mike Schroepfer offered two substantial teases on the headset. First, he revealed that Project Santa Cruz is currently in the hands of third-party developers. Second, he said Facebook will have "exciting updates" about Project Santa Cruz to share later this year. "Later this year" lines up with the annual Oculus Connect conference, which usually goes down in October. Is it then that the Project Santa Cruz release date will finally be revealed? It appears that could very well be the case. Project Santa Cruz is a new standalone headset from Oculus, makers of the well-known (and very tethered) Oculus Rift virtual reality (VR) headset. Alright, the headset isn't actually new. Facebook first announced it was working on Project Santa Cruz, which doesn't require a PC or phone to operate, during the 2016 Oculus Connect developers conference. At the 2017 Connect conference, we were treated to a far more refined prototype. Plus, we learned that the headset is making its way to developers in early 2018 (update: this has indeed happened). We got to try the latest Project Santa Cruz prototype for ourselves during the most recent Connect in San Jose, California. No photos or video were allowed, so we can't show you what the headset in its current form looks like exactly, but we got 15 minutes to experience the VR on offer from the next-gen headset. From our short time with Santa Cruz, it looks mighty promising. Project Santa Cruz looks and feels similar to the Oculus Rift, with a few key exceptions. Santa Cruz has slightly rounder edges around the visor than Rift, and there are four sensors embedded in each corner for inside-out tracking, which means no external cameras or sensors are required. Everything is contained in the headset, including all the components that run the VR experiences. Santa Cruz is a bit heavier in the front than Rift, though far from uncomfortable to wear. We actually noticed the weight more while holding the headset than when we wore it. The headset was relatively easy to slip on and take off, which can't always be said about Rift. The headset portion has a soft, cloth-like quality that feels good in the hand. The straps that go behind your head are made of a stretchable rubber material. This is a break from the more rigid plastic straps found on Rift. Project Santa Cruz's straps stretch to go around your head before snugly cradling it. The whole contraption is secure as you move around VR worlds, with no slippage. It feels akin to wearing a well-fitted hat. Again, Project Santa Cruz is a prototype, so everything from its parts to its design is subject to change. But, pending a little more refinement – it still looks like a prototype and not a finished product – we can see Project Santa Cruz hitting the market in close to its current form. One welcome feature of Santa Cruz is that there are no headphones to flip over your ears, as is the case with Rift. The sound is integrated into the headset, allowing you to hear clearly what's going on in the room around you while not losing your sense of presence in the experience. The sound has an all-encompassing quality as it emanates from the headset, and we were drawn into the VR worlds in a way we've never quite experienced with Rift. We tried two demos with Project Santa Cruz. These gave a good sense of the headset's capabilities, though didn't match the more intense games we've played on Rift. In that sense, it's difficult to do an apples-to-apples comparison. Still, the experiences were smooth, and though there was a slight granular quality to the graphics, these were also crisp. The first demo was called Boundless. We were tasked with feeding a creature named Bogo, a cute dog-like dragon. The creature came up to us when we offered it pieces of fruit, and ate from our hands. We plucked the fruit from trees using the Project Santa Cruz controllers. Later, we played fetch with Bogo, chucking a digital stick across a whimsical landscape. Boundless was a cute and fuzzy world, one that we could explore thanks to the absence of a thick cord connecting Santa Cruz to a PC. When the demo first started, we kept ourselves confined to the limited space we're used to with Rift. But, after stepping outside this arbitrary zone, we realized we could crouch, bend and move around completely unrestricted. This freedom was even more pronounced in our next demo, called Timestall. We had to fend off robot invaders and bat away debris before either reached a friend who was in cryogenic sleep, or destroyed his life support. In this demo, we really flew around the room. We leapt over a crack in the floor and swung our arms to push objects and robots out of the way. We dodged, swatted and jumped without the fear of getting tangled in a wire. It was liberating and a whole lot of fun. We've often caught ourselves somewhat frustratingly pushing the wire attached to Oculus Rift out of the way. Because you're tethered to another object, you're limited to a confined range of motion. With Santa Cruz, the room is literally your playground, and you're free to move around as you please. And in case you were wondering, yes, Santa Cruz has a chaperone system. A blue grid wall appears when you reach the boundaries of the space, and this kept us from venturing too close to any real world objects. Thanks to the chaperone, we felt free to move around without any added worry. Project Santa Santa Cruz doesn't come alone. It also features a new set of controllers. Think of these as Oculus Touch 2.0. The Santa Cruz controllers are smaller than Touch, and fit more comfortably in the hand. While they initially felt almost too small, you forget you're using them after a while, which seems like a good thing. Whereas Touch has an analog stick and big ABXY buttons on the top, Project Santa Cruz's controllers do away with these and replace them with a trackpad. Unfortunately, our demos didn't include using the trackpad and only relied on the grip and trigger buttons, so we didn't get the full effect of using the new controllers. The Santa Cruz controllers were more responsive than Touch, and that's likely thanks to the integrated six-degree-of-freedom, of 6DOF, tracking. This makes it so the controllers are more accurate at tracking your hand movements, which they have to be as you move around more freely in VR. We've always been a fan of Touch, and Project Santa Cruz controllers only build and improve upon the experience, refining it and doing a better job of keeping up as you move around. Though our time with Project Santa Cruz was short and the headset is a prototype subject to change, what we experienced was impressive. While we didn't get to see all that Santa Cruz can do, it provides something Rift can't: movement. The experiences, albeit limited, were quite good, and were only enhanced because we could move and interact with the environment. The 6DOF controllers fit nicely into the picture, and while we'll have to wait before we can pass judgement on the trackpad, the controllers feel like they are right on track. It might be easy to say Project Santa Cruz is a Rift without a wire, and to some extent, that's true. The headsets are very similar, from design to experiences. Santa Cruz's graphics only looked like a small step down from Rift, and there was no lag during our demos. There was a perceptible screen door effect at times, but it wasn't distracting or detrimental to the overall experience. But, Santa Cruz also seems to occupy a space all its own. Inside-out tracking and the controllers give Santa Cruz a bit of an HTC Vive feel, while everything else about the headset keeps it firmly in the Rift family. It's in the blending of these two experiences with movement thrown in that makes Project Santa Cruz its own beast. That being said, the big question now is how much Project Santa Cruz will cost. Will Oculus position it below, the same as, or above the Rift, price-wise? It's hard to say, and Oculus is keeping tight-lipped on those details. Cost remains a barrier to get into VR, and pricing it too high could keep Santa Cruz out of the hands of many. 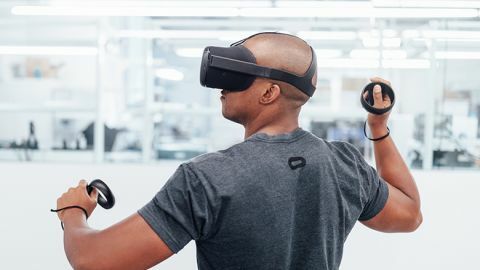 But, price it right, and Project Santa Cruz – which will almost certainly be called something else by the time it reaches consumers – could be the virtual reality headset everyone has been waiting for.